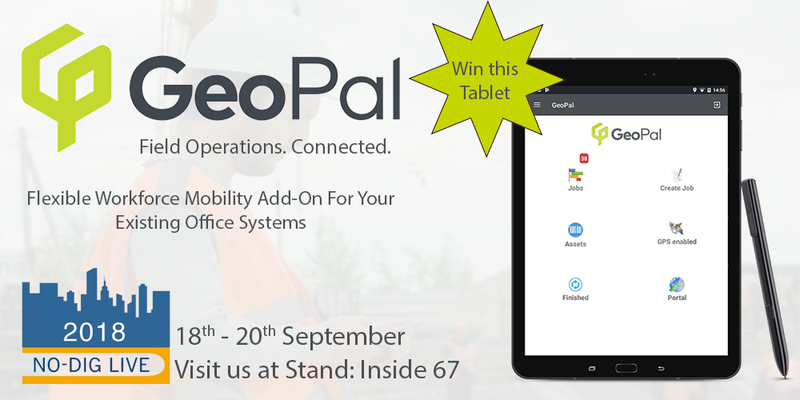 GeoPal will be exhibiting at this years NO-Dig Live - Stand Inside 67 - to showcase our customisable mobile workforce management application that connects field workers, remote assets and IoT sensors, leveraging field data to immediately gain actionable insights and increase the productivity, profitability and health and safety compliance of your business. Our clients include some of the largest Utility Services, Industrial Services, Environmental and Facilities Management companies in the world. GeoPal create the core software infrastructure that companies need to mobilise their field-based workforces. Following on from our recent partnership with Leica Geosystems, we will be giving an overview of how their job workflows, together with Leica hardware, can be used to implement a “Zero Strikes” strategy to eliminate fines and penalties incurred from underground strikes – a growing concern for companies operating in the utilities space. The team will be demonstrating how all current paper field forms (Timesheets, Day Work Sheets, Health & Safety Checks etc…) can easily be replicated in the GeoPal Mobile App to completely eliminate paper processes from the field and provide real-time reporting as well as proof of work completion. During the show, GeoPal will be running a competition to win a Samsung Galaxy Tablet – but it’s not the typical “drop your business card in a bowl” type entry. You will have to download the GeoPal app and sign up to complete a job which will include completing a number of steps within the arena – essentially following a workflow of a typical job in GeoPal (don’t worry, they’ll keep the work to a minimum!). You will need to submit a fully completed job to be in with a chance of winning! Make sure you visit them on stand Inside 67 to find out more. If you are attending the show and would like to arrange to speak with a member of the team - please email sales@geopal.com and we will organise a time that works for you! Kieran is the Marketing Manager at GeoPal with a number of years of experience in promoting SaaS product offerings through both traditional and digital marketing. He also moonlights as a DJ at the weekend, so prepare for the occasional music reference!